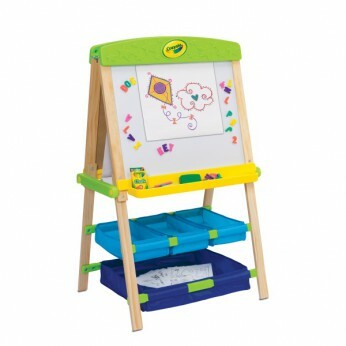 Double sided easel: magnetic/Dry-Erase and chalkboard surfaces with detachable legs. Detachable legs convert easel to a table top use. Paper roll dispenser fits 12in and/or 18in roll of paper. Plenty of storage. Large paper clip to hold paper. Includes: 1 Crayola Eraser,10 Sheets paper stencil, 77 Magnetic letters and numbers, 12ct Crayola colored chalk, 30ft x W12in Paper roll starter (Paper roll not included), 4 Fabric storage/organizer. 54Lx61Wx114Hcm…. This toy costs approximately £84.99 (for the latest and best prices make sure you check our retailer list for the Crayola Draw N Store Wood Easel above). In our review of Crayola Draw N Store Wood Easel we classed it as being suitable for ages 3 years, 4 years, 5 years but recommend you check the manufacturer specific advice before purchasing.